Sark is probably one of the UK's most unique destinations: famed for its almost feudal governance and total lack of cars or streetlights. Small in size, but long and thin with very crenelated edges, Sark has a lot of coastline and some of the best places to stay in Sark allow visitors to make the most of this. Perfect to explore on two feet or two wheels....It's definitely worth knowing that here street signs refer to how many minutes it will take you to walk somewhere, rather than the distance in miles. Pay a visit to the historic La Seigneurie - an estate dating back to the 17th century. The house and gardens are excellently maintained and visitors can lose themselves in the maze. Ride one of the iconic horse and cart's around the island with highly-informed guides on hand to tell visitors all about the island and the history. Peep out the Window in the Rock - a dramatic gap in the rocks perched precariously above a vertical drop to the sea below - not one for the faint of heart! Explore the island on a bike with some truly stunning roads allowing visitors to experience the real beauty of the place. The best places to stay on Sark fill up quickly in the peak summer months so book your idyllic summer holiday soon to avoid disappointment. 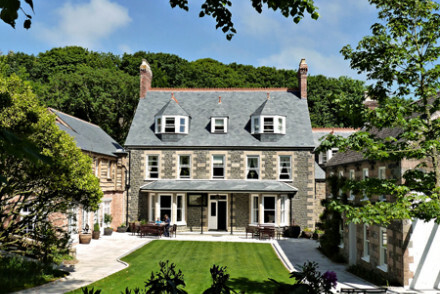 Stocks Hotel on Sark is perfect for relaxing in style. Originally built in 1741, this hotel has been refurbished to include all the mod. cons. There's plenty to do from yoga to croquet, to birdwatching, tennis, art classes or even a Scuba course - but the beautiful surrounds make this the perfect place in which to do very little. 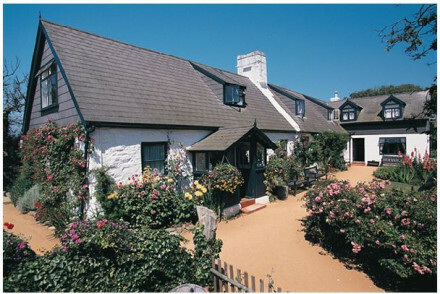 La Sablonnerie is a collection of cottages and homes all decorated with a traditional, rural feel on peaceful Sark. The owner/ manager wants it to be a oasis of good living and courtesy and does her best to make sure this sentiment is in everything they do. From the horse drawn carriage that meets you on arrival to the home grown food served in the restaurant. If you'd prefer a self-catering option this holiday, don't hesitate to visit our online partner Booking.com for a range of properties near to Sark - ideal for a day trip to the island. Fly to Guernsey Airport serving the UK and other Channel Islands and is located 6km (3.7 miles) from St Peter Port. Visitors can catch a ferry to Sark from Guernsey with several sailings per day in summer and a reduced daily winter service. Best time to visit - the summer months from June to early September typically provides the best weather for exploring the island and is when many of the island's attractions and shops are open. You arrive here by horse drawn cart - no cars on Sark. This oasis of tranquility at the quite end of the island boasts fine dining, with food from its farm and gardens. Simple, cottagey rooms, some in separate houses. Stunning scenery and quiet beaches all around. Magical. Restaurant - Fresh produce from farm and garden. Sark's luxury hotel, recently renovated. Spacious rooms and suites with all mod cons, large outdoor pool surrounded by mature gardens. Family friendly, with small spa and gym. Spa - Small spa treatment room.